Transcutaneous electrical nerve stimulation (TENS) is a therapy that uses low-voltage electrical current for pain relief. 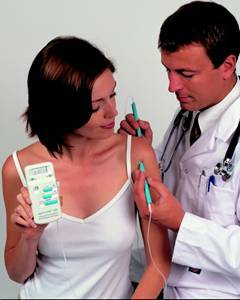 The TENS unit is a small, battery-powered machine about the size of a pocket radio. 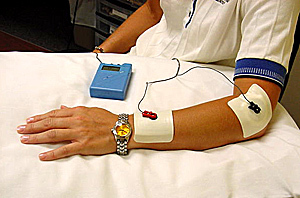 The therapist connects two electrodes from the machine to your skin. The electrodes are often placed on the area of pain or at a pressure point, creating a circuit of electrical impulses that travels along nerve fibers. The mild electrical current generates heat to relieve stiffness, improve mobility, and relieve pain. The treatment is believed to stimulate the body's production of endorphins or natural pain killers. We use TENS to relieve pain for several different types of illnesses and conditions such as arthritis, back pain, neck pain, tendinitis and bursitis. Alpha-Stim is a micro-current electrical therapy device used for the treatment of pain, anxiety, depression and insomnia. Alpha-Stim generates a unique, proprietary electrical waveform that allows a patient’s cells to operate naturally, thus bringing relief. Relief lasts well after the treatment, and over time, requires less frequent use. It works with the body on a large variety of ailments including difficult to treat pain problems such as acute, chronic and postoperative back/neck pain, shoulder pain, hip/leg pain, carpal tunnel, TMJ, arthritis and fibromyalgia. Iontophoresis is a method of delivering medication through the skin by using a gentle electrical current. Iontophoresis is mainly used on musculoskeletal inflammatory disorders, such as plantar fasciitis, tendinitis of the shoulder, elbow and achilles, as well as bursitis of the shoulder and hip.